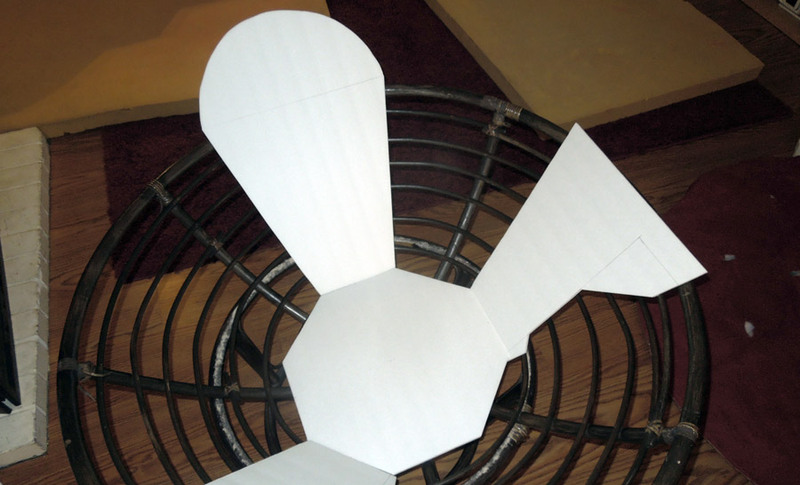 How to Make a giant flower out of memory foam and fuzzy fabric. 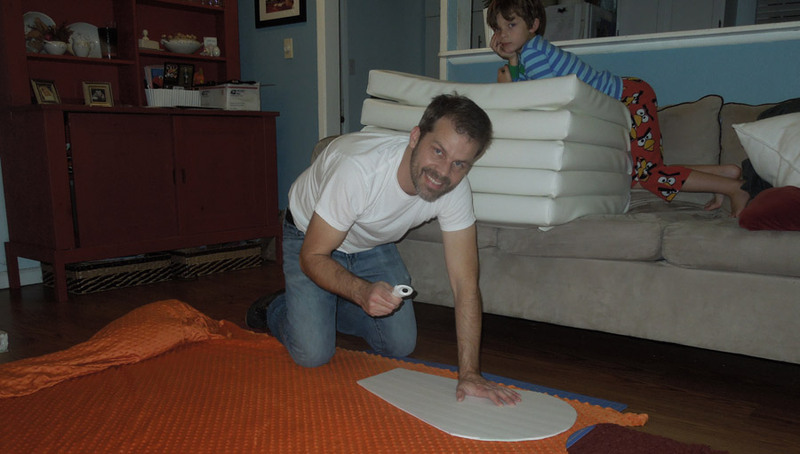 When my all-foam stunt ottoman was finished, I was ready to tackle another piece of furniture, a papasan chair. I had obtained a huge sheet of memory foam at a garage sale, and I was certain it would make a fun chair. It was super soft, and I wondered what it would be like if I covered it with super-plush fabric, like a the skin of a plush stuffed animal. 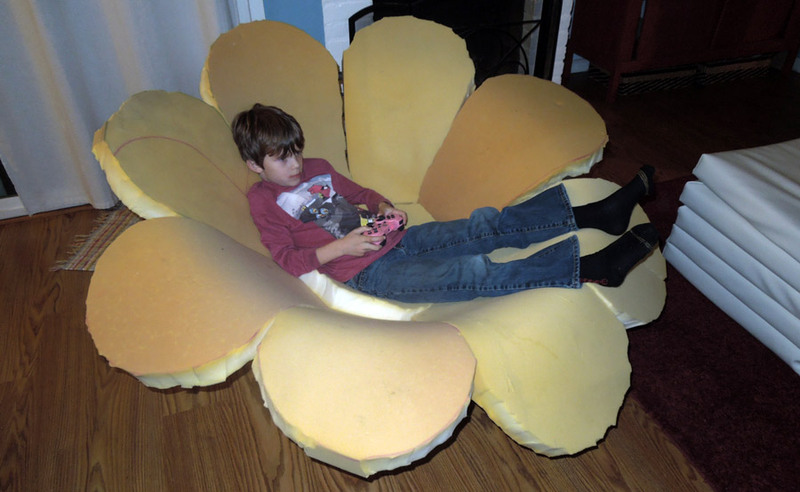 Next I pored over some photos of a flower chair in Google images. Wow, the flower chair had been done a million different ways, but it was a natural extension of the cup-shaped lounge chair. I opted to skip the woodworking and to start with a foundation of a papasan chair. I found one in no time. 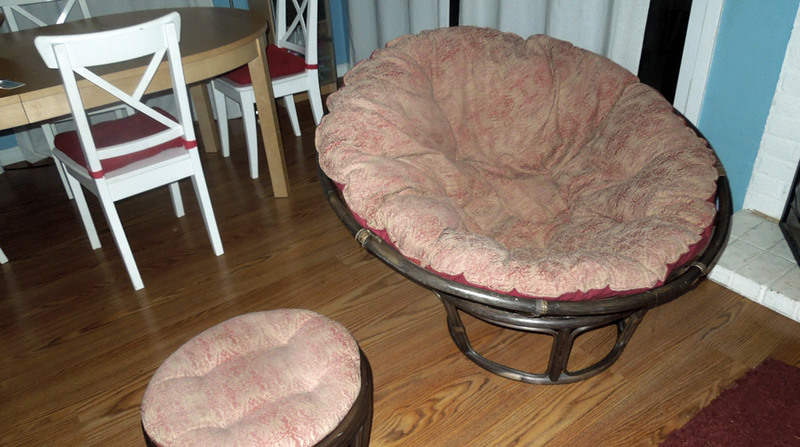 There are a bunch of papasan chairs on Craigslist, probably because they are cozy and fun, but not very classy or practical. It was $15. With the original papasan cushion in the trash can, I began cutting pieces of foam board to mock up the size, shape and placement of my foam pieces. I can almost always design projects on paper, but with the complex angles of lining this bowl, it was easier to use cheap foamboard first. The bottom of the bowl ended up being an octogon, with eight trapazoids making the turn up to the edge of the chair. At the last minute, I realized I had more than enough foam to make the trapazoids into petals and added a half-circle at the top of my form. 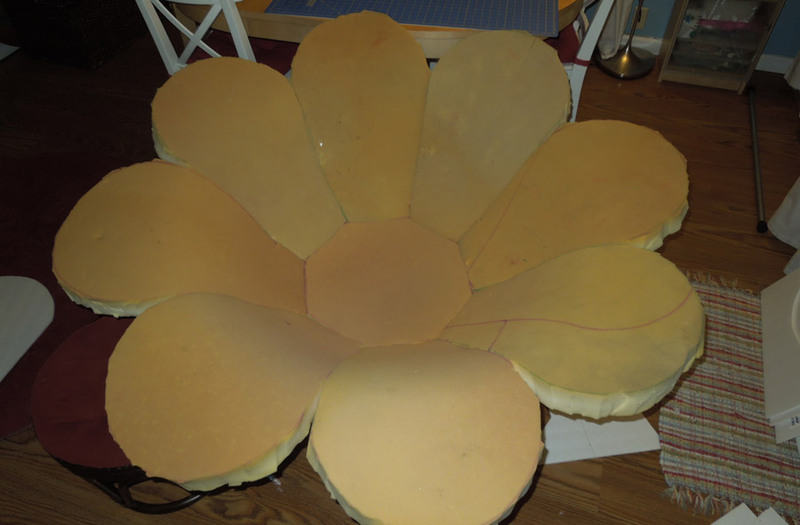 I used the foamboard petal form to trace petals onto the foam sheet. There was a fair amount of wasted material, but there was plenty for the eight petals and two octogons for a double-thick centerpiece. I used tin snips to cut the foam. The rounded tops draped over the top edge of the bowl. They looked about a hundred times more like flower petals than I was expecting.This was going to be great! While I figured out the pattern for the cover, the kids fought to be the first to sleep within it. I still had to figure out how I was going to encase this thing in fabric. My first thought would be that I would glue the foam petals to the center octogon, then cut and sew two huge flowers together. The bowl shape of the chair was going to make that difficult. I imagined that the fabric on top would tend to bridge across the top of the bowl, lifting the fabric away from the center of the flower. If there was one thing I learned from making the stunt ottoman, it was that upholstery looks best when the fabric cover is bulging with stuffing. 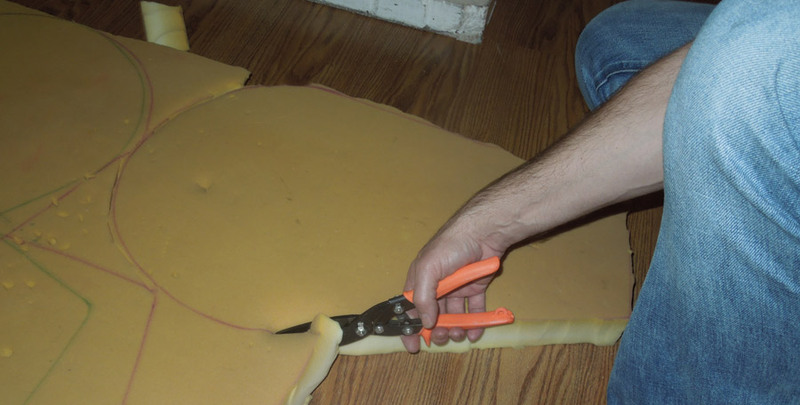 I didn't want to repeat the look of a loose-fitting fabric cover. If I wrapped each petal individually, the result would be nicer. But with that intention, I wasn't sure if I should use a long strip along the thickness of the petal, or if I should just join the top and the bottom fabric, allowing the foam be squeezed in there. After some thought, I decided to use a design which was halfway between these two options. I planned to use two pieces of fabric to cover the petal, with an extra little triangle of fabric added to the edge, where it met the side of another petal. Piece of cake. I didn't want to wrap the super-soft foam in a sheath of rugged fabric, so I opted for a very soft, thin and fuzzy material usually used in baby blankets: Minky Dimple Dot. I found a bright orange color for sale on Amazon. It was $6 a yard, plus $3 a yard for shipping. I verified the color and price at Joann's Fabric in Sacramento. This fabric is $19 a yard at Joann's, but it is often on sale for $9.99. 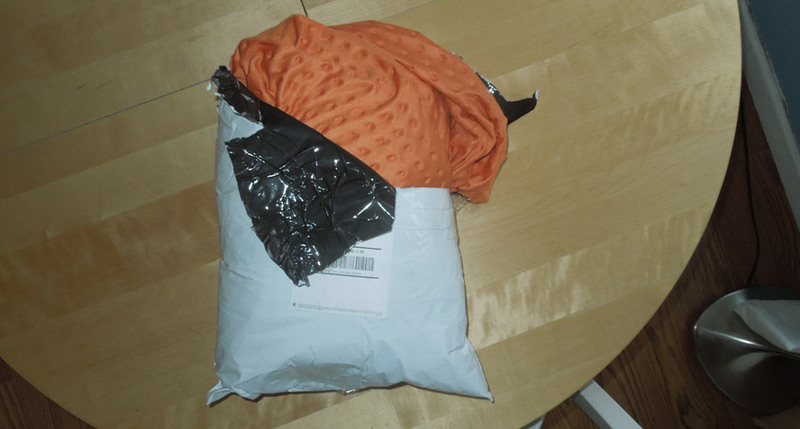 I ordered six yards, and I couldn't believe the size of its little shipping bag! This was six yards of fabric? It was. I got a rolling cutter and a cutting mat for Christmas, and I was excited to use them on this big project. 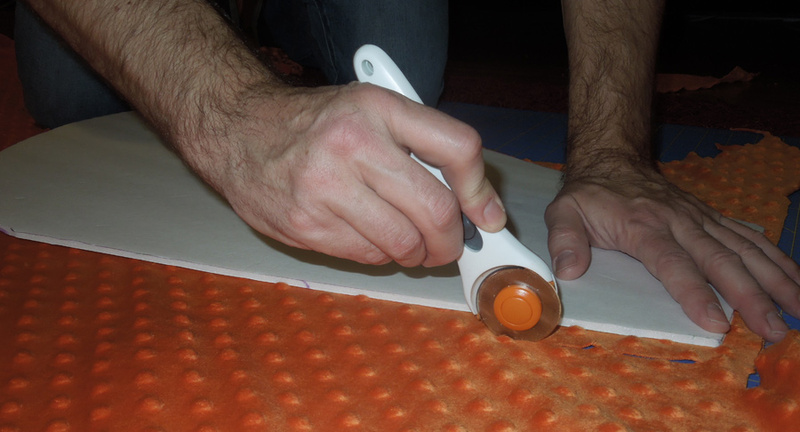 When I was 23, I cut the hell out of my thumb on one of these roller cutters, so I shied away from them for about 20 years. Please continue reading page two of the Papasan Flower Chair. Update! I added a second layer of petals!.